"Here we meet the genial, businesslike schoolman, Superintendent B. O. Greening. Here is located the finest high school building, architecturally, in the state. Superintendent Greening knows how to select his faculty so as to keep his school and the pupils models for work in this attractive surrounding. Were you at Eveleth, you would exclaim: 'How can they do it in this apparently barren, uninviting country?' It is not barren, it is fabulously rich. It is not uninviting, it is moving in the ranks of the cultured." 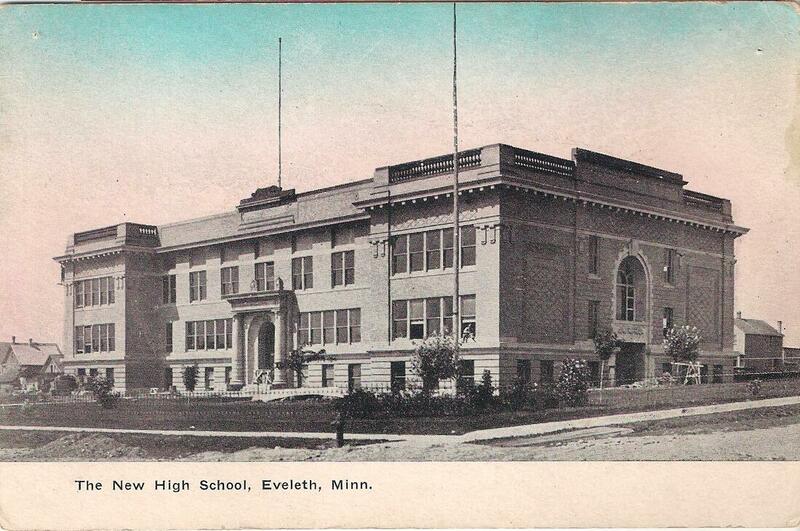 When Eveleth's three-year-old high school was destroyed by fire on June 26, 1908, plans for a replacement began almost immediately. Construction began in October with a workforce of 49 men. The firm of Bray and Nystrom considered replicating the burned-down school, but the new building looked completely different and contained architectural motifs that were later repeated in the Fayal School, the Senior High, and the Benjamin Franklin School. 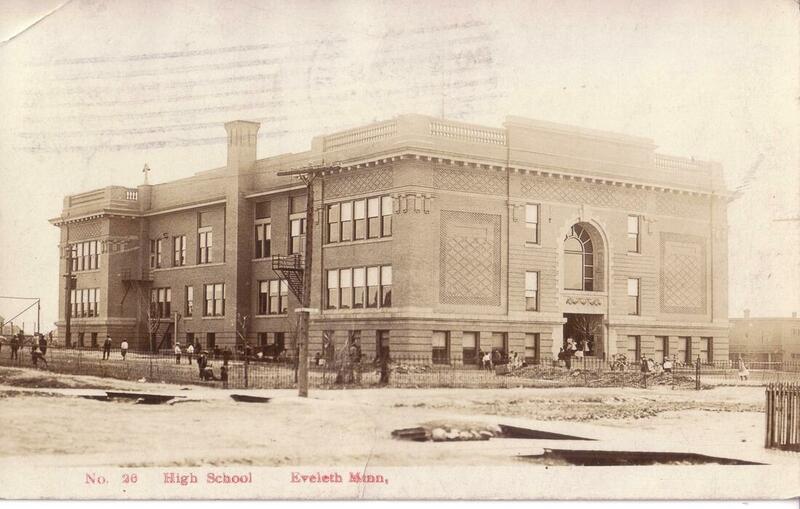 The new $73,000 high school opened on September 10, 1909, just under a year after construction began. 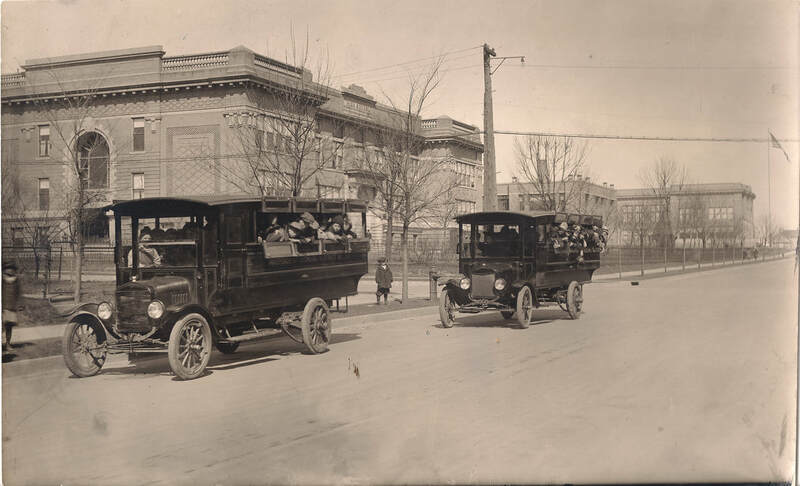 In addition to approximately ten regular classrooms, the new high school contained a library, science laboratories, a gymnasium, a machine shop, and rooms for woodworking, domestic science, and sewing. Classroom ceilings were 13.5 feet tall, and corner rooms contained girls' and boys' cloakrooms. Statues stood along the main hall, paintings hung above pine wainscoting, and the ceiling featured a plaster cornice. The assembly room and study hall on the second floor had a 20-foot ceiling, and two chandeliers hung in the center of circle with 100 smaller lights. The building's exterior was adorned with a tin cornice, a galvanized iron balustrade, cut stone, and decorative terra cotta. Looking east along Jones Street at the Eveleth school campus, circa 1920. The high school became the junior high once the Senior High opened in 1918, and the ground floor was occupied by school district administration. 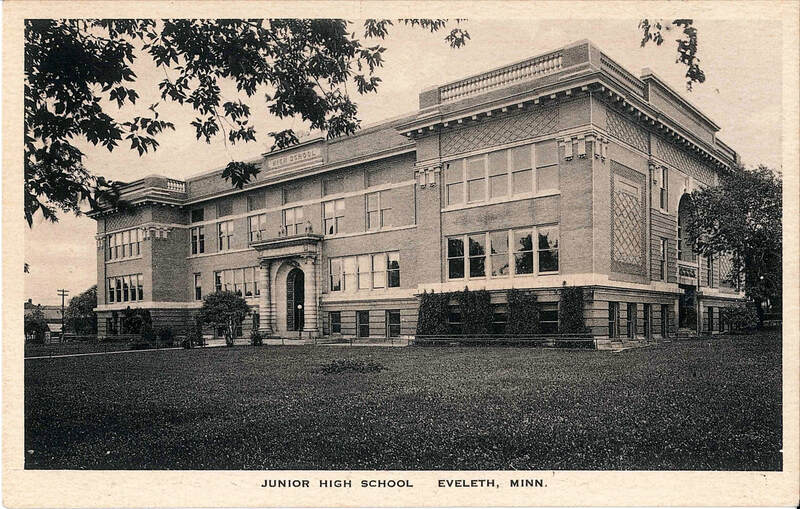 As the Eveleth Junior High, the building mainly housed grades seven through nine except for an experimental year as a middle school in 1971-72. The junior high closed at the end of the 1985-86 school year; that fall, the Eveleth and Gilbert schools began their pairing and sharing arrangement that led to their consolidation in 1993. ​The exterior has been altered several times. Lettering above the main entrance originally said "HIGH SCHOOL" until the 1930s, when it was replaced with "JUNIOR HIGH" to reflect the building's new function. By the 1970s, the decorative stone, iron, and tin were removed, new glass block windows were installed, the two large lamps outside the main entrance were removed, and the outside entries were modified. The interior remains mostly unchanged, except for lockers in the hallways, hanging fluorescent lights, two new rooms in the study hall, and updated furniture. From shortly after the school's closure until 2017, Chicagami Children's Center, a daycare facility, occupied the ground floor, and parts of the first floor were used in the 2005 film North Country. The Eveleth-Gilbert School District has officially closed the building for educational purposes, but there are not currently any plans to repurpose the structure.